The HR Technology landscape is filled with a lot of jargon, and frankly, most of it benefits marketing executives within HR/HCM solution providers more than those procuring one of these solutions. Some of the jargon is wrapped in acronyms such as SaaS (Software-as-a-Service), ERP (Enterprise Resource Planning) Systems or ATS (Applicant Tracking System). SaaS refers to the hot trend in recent years to “rent” vs. purchase HR software applications, typically through the cloud delivery model where every customer is using the same “instance” or version of the software. ERP platforms (e.g., in HR, Finance, etc.) are the technology platforms for running business processes and managing related transactions. These systems include a data model, processing and workflow rules and end-user security permissions. ERP’s also interface or talk to other systems inside and external to the organization. Finally, ATS tools came on the scene in the 80’s and more recently offer innovations allowing more proactive and personalized outreach to both active and passive job candidates. ATS’s track candidates through the sourcing, screening and eventually hiring/on-boarding process; and now often include or plug into tools/technologies for video interviewing, social sourcing, behavioral assessments, job simulations and employee referrals. Arguably the most important jargon heard in the HR Technology domain refers to the type of solution being discussed. We’re not referring here to functional solution types such as recruiting, performance management or learning solutions. “Type” in this case relates to the category of solution. Why is this so important? Well, it’s a great place to start a conversation with an HR Technology vendor, from which many other key questions should logically follow. For example, once you’re told a solution provider operates in the “HR-ERP” market or its alternative label, “Core HRMS “ (Human Resource Management System) space, you immediately know they offer a transactional HR platform and “system of record” for recording relevant data and enabling analyses around all events in the “hire to retire” employee life cycle. You can also associate this category of HR system with passing presumably validated data to systems used by other corporate functions and external service providers. Typical vendors mentioned in this category are Oracle, SAP SuccessFactors, Workday, ADP, Infor, Kronos, Ceridian, Ramco Systems, Zenefits, etc. If, however, you were getting a presentation from a Talent Management Suite or “TMS” provider (popular vendors include Saba, Cornerstone OnDemand, PeopleFluent, Silkroad Technology, etc. ), you won’t hear much talk about a system of record for employee life cycle events and transactions, but will likely learn about their best of breed, functionally deep modules that are tightly integrated. 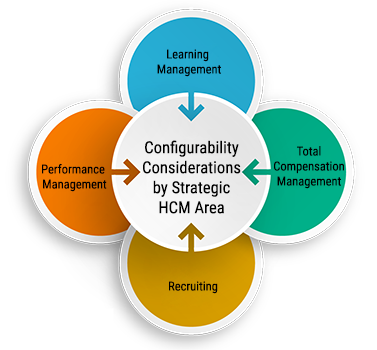 A TMS is essentially the coupling -- through various degrees of “tight integration” and through various degrees of offering a common user experience – of individual modules each designed for automating a specific HR process like recruiting, learning or performance management. The relative extent of tight integration and common user experience (look and feel) across the different modules is typically tied to whether all the modules were organically built by the same vendor, or whether some were acquired and are being brought into a common solution framework over time. The main difference between a Core HRMS or HR-ERP platform and a TMS are twofold: The former includes the system of record for employee life cycle transactions and is fairly broad in functionality; and the latter excludes the broad transactional HR recordkeeping but tends to offer deeper functionality for achieving best-in-class HR process design and support. Finally, Best-of-Breeds are simply the category of HR Tech solution where single or “point” solutions are offered for automating and enabling just one HR process area, such as the aforementioned ATS for recruiting automation. Those operating in the HR Tech domain for some time likely know exactly what this section header is referring to, namely that many customer organizations go through “preference cycles”, which can take a few years or considerably longer before pursuing another HR Tech strategic path. Many customers will seek to consolidate disparate solutions from different vendors, and migrate to a unified solution from one vendor, after complaints from end-users about things like redundant data entry, having to learn multiple user interfaces or “TCO” (total cost of ownership) in general. On the other hand, a subset of HR Tech customers find themselves going in the opposite direction, again, usually after enough complaints from end-users. These organizations then pursue a strategy of deploying specialist or best of breed solutions, or solution suites. This direction is sometimes viewed as essential for handling HR process pain points that are not being adequately addressed by the incumbent, core HRMS platform, or perhaps to align better with HR process nuances needed by their business. Pendulum swings can also result from factors not very related to the virtues or gaps of particular HR software products. Case in point: a new executive in the mix simply prefers another HR Tech solution or strategic approach based on their previous experiences.